Make a dramatic entrance with this unique beaded necklace from Tiraphan Hasub in Thailand. 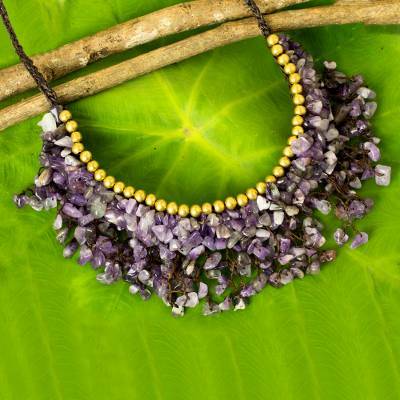 The stylish cord necklace features myriad amethyst chips knotted together, topped with shiny brass beads for contrast. The necklace fastens with a toggle crafted of amethyst nuggets. You can find beaded amethyst necklace 'Dance Party' by Tiraphan Hasub in jewelry categories such as Birthstone Necklaces, Amethyst Necklaces, Brass Necklaces, Polyester Necklaces, Beaded Necklaces, Cord Necklaces and Statement Necklaces. Enjoy exploring these sections for other Novica treasures. "Gift for a new mother"
Beautiful and flashy use of multiple amethyst chips tightly woven into an exquisite choker. A gift for my daughter who has just had a baby. The amethyst is her babies birthstone. She can ultimately gift it to her new daughter when she is old enough. I just got my necklace a couple of days ago and wore it today and got lots of compliments on it already, not only from friends and family but perfect strangers too. It is so unique and beautiful and is very well made. "Just as beautiful as pictured"